Interronauts is our podcast that puts a rose-tinted magnifying glass to science news from around the world, Australia, and inside our organisation. Hosted by Jesse Hawley and a rotating cast from our communications team. Jesse sets off on a solo venture through the overgrown and tangled world of science news this Interronauts, beginning at the beginning with early Earth perhaps implanted with purple, not chlorophyll green, pigment, before heading undersea with two new species of very small jellyfish discovered by CSIRO researchers, bush-bashing in the crops, the cropage, with our and the Chinese Academy of Sciences’ work blending the benefits of brown rice with the pale ease of white rice, trekking through the clonal trunks, the forest of one known as Pando to get to the base of its stunted growth, and finally wrapping up in the cool slightly sour-atmosphere of a packed cinema, finding out how our smells might reveal movies’ classification. Umm…ah…it’s Interronauts…we think. Join Jesse and Sarah as they discuss the ideal number of choices to choose from, a tiny imperilled fish and how we’re helping to rebuild the critically endangered, fearsomely cute spotted handfish in Tasmania, Australia’s roadmap towards a future in space, AND we chat with CSIRO researcher Dr Rich Pillans recently back from the Top End and a bonza survey of some of our most endangered aquatic life, including the speartooth shark, northern river shark, and the seven metre leviathan: the largetooth sawfish. Cowabunga! On this episode of Interronauts Kate and Gavin join Jesse to talk about scourges of our times: marine debris and antibiotic resistance, as well as science’s endeavours to set us on the straight and narrow, the clean and biotic. They also talk about the use of third person in podcast descriptions (“We don’t actually, we prefer first person but are twenty episodes into the precedent…”), NovaSAR-1—a new state of the art satellite, which provides Australia 10% helm-time, and finally, a rare case of organ transplant complications and a crazy little thing called CTVT, a disease, but also a single-celled dog. You’ll just have to listen. Up, up, and away with Kate and Gavin and Jesse on this episode of Interronauts where they talk about a new treatment for pancreatic cancer using killer cells, CSIRO’s new vehicles powered not on gasoline but hydrogen, and a fortnightly science digest about the oldest cheese, neutron stars, omnivorous sharks, and moooore. This episode technophile Ketan teaches technophobe Jesse about big data and the big burden it bears, why robot marketers are more unnerving than you know, how hackers might have swiped your fingerprints (drats; crims are supposed to leave ’em behind, not steal ’em), this fortnight in science news, and isn’t it ironic? Well, isn’t it? No, not really. It’s our new cotton that doesn’t crease and doesn’t need ironing, it’s like ten thousand spoons when all you need is a knife. Josie, Jessie, and Jesse discuss the need to name marine heatwaves, the waylaid northern bald ibis, distal clues to gold deposits, the plants of Antarctica and speak with one of our wearable tech experts, Samy Movassaghi on her research and career path. Interronauts’ nine month hiatus is abatus and we’re back! This episode, Sarah Frazer joins the roster to talk about our robot ecologists in the Amazon, the plan to augment feral cats into all-male clowders, the use of ugly veggies into delightful powders for your coffee, and researchers’ best attempt yet at weighing all life on Earth. This time Jesse’s on production, but the sound will improve. Koala bear with us. This fortnight Jesse and Sophie have a special selection of science news, plucked from all over town in this, their penultimate episode. In their first ontogenetic episode yet, they chat about breaking news from Yale on the evolution of pregnancy in marsupials and eutherians (ourselves), childhood learning in apes (bonobos’ inability to copy silly stuff), a chat with Dr Olivier Salvado about iron deposits’ relationship with Alzheimer’s, and finally the living funeral of NASA’s Cassini as it plummets into the Saturnian atmosphere — and you’re invited! Join Jesse and Sophie as they snap back to reality, whope there goes gravity…*ahem* — as they discuss last fortnight’s science news: plant defences that turn herbivorous caterpillars into cannibals, our RV Investigator’s voyage to Sample the Abyss, the new project to rescue imperfect fruit and veg and turn them into healthy food products, and finally their new segment: Deconstructed Croque-MonScience, where Sophie guesses research findings and methods based on the title of a paper. Join Jesse and Sophie as they cast their net overboard to snag last fortnight’s science news before heaving it aboard with their gelatinous biceps for us all to sort through. Here’s the catch: they talk about how it is that we’re able to remember (tens of) thousands of faces with relative ease, our new algorithm that can model blood vessel growth to pre-empt tumours, the ancient origins of Homo sapiens (100 000 years older than expected), and, they speak with Robert Whyte, co-author of A Field Guide to Spiders of Australia — the latest and most comprehensive guide to those wonderful eight-legged friends. 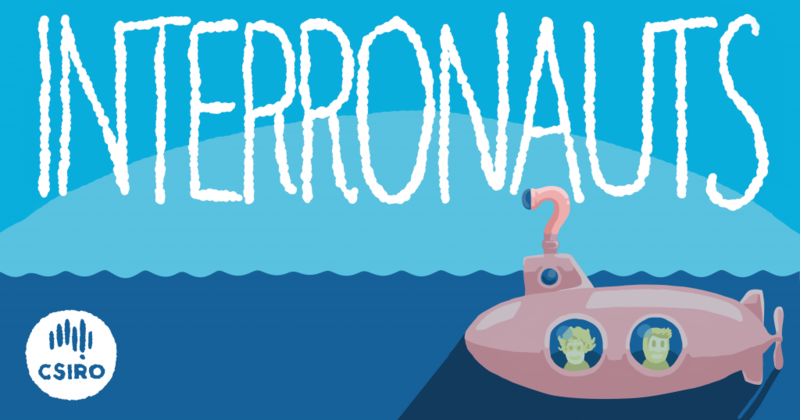 Dive back into science news with the Interronauts! Jesse and Sophie are back with a brand new episode, studio, the whole kit and caboodle (kitten cavoodle?). They talk about why it is that the fittest Tassie devils are most likely to succumb to the deadly facial tumours, how to pipe renewable hydrogen, why some shark mammas hook up with multiple pappas, and they speak with Dr Lisa-ann Gershwin about her to-date co-discovery of 204 species of sea animals (including a DOLPHIN!). Join Jesse, Sophie, and Adrian as they talk about how the world’s worst extinction was caused by microbes, mandrills that don’t groom those with sickly faeces, Neanderthal’s making jewellery, and their chat with Dr Rob Kinley about his research feeding seaweed to cows to neutralise their methane emissions. Methane special! Join the Interronauts—Jesse, Sophie, and Adrian—as they go dinosaur hunting along the west Australian coastline with Dr Steve Salisbury (not Turok). They also chat about sensitive dinolovers, CSIRO’s new lab-on-a-glove, and Mars’ ghost of an atmosphere. Let’s zip ourselves up and get mailed back to the Cretaceous. Join Jesse, Sophie, and Adrian as they dive deep on the evolution of the human nose, tardigrades (check ’em out) and how they dry out for 30 years, why water droplets splash, and some work on climbing foxes. They also speak with Dr Ken McColl about the ambitious plan to release a strain of herpes to target pest carp in Australian water ways. Woo it’s a bumper episode! Jesse, Sophie, and Adrian get together to chat about the uninvited microbes that stumble into our guts, how you can store Amazon gift cards on DNA, the mutations behind mirror movement disorder, and CSIRO’s 3D printing of a titanium sternum and polymer tissue. We also speak with Michelle Trautwein about her new project ‘Arthropods of Our Homes’ to catalogue the Australian arthropods we share our homes with. Enjoy the show, why don’t you. Jesse, Sophie, and Adrian join interroforces to discuss the antimicrobial properties of dragonfly wings, how roundworm genes might inform weight gain, how desert ants navigate their way home, and from CSIRO, a new way to make graphene (the world’s strongest material), pesky mobile Virtual Private Networks (VPNs), and we cross over for a live chat—podcast live—with Asaesja Young, one of our communicators in Antarctica. Enjoy! Jesse, Sophie, and Adrian talk about menopausal whales, panda thumbs, Tasmanian tiger brains, and frisky wrens. They also have a chat with Dr Lisa Harvey-Smith about the launch of the new ASKAP radio telescope, and discuss research around CSIRO: mouse plagues and trips to Antarctica. I love the podcast,brilliant job. Entertaining and educational and fun to listen too. Thanks very much, Andrew! We enjoy making it and are glad you enjoy listening. Great jobs guys, loving the science news in accessible and hilarious way – my new favourite podcast!